As We know Firefox is one of the most popular web browsers in the world. It has so many users and great thing in it is that it is world's best browser which can work fine with Internet Download Manager. 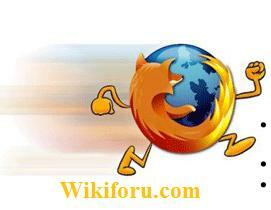 But many users report that they have slow speed in firefox, in fact Other Browsers like Google Chrome has more Speed. This is Because it uses a small number of connections to get data from any website. But don't worry, i am here with a new trick that can increase your Firfox Speed. In this Tutorial we need to change some settings in Firefox. and press enter. Now you will see a waring. Click on I"ll be Careful I promise! 3. Now right click on it and click on Modify. 4. Now set its Value to 16.By default it is 4. It is the Number of Simultaneous Signals to retrieve data. 6. Now again in Filter type : network.dns.disableIPv6 , Right Click on it and Select Toogle. 7. Now Right click in blank and select New->Boolean. and its value to true. 8. Now lose this Window lick on Tools-Options->Click on Advanced Tab->Network-Offline Storage->hange its alue to 500,By default it is 5 MB. One More thing, Expand your Cache Size.